As shown in the elementary schematic diagram of Figure 2, the Type 1390-A Random-Noise Generator uses a gas-discharge tube as the noise source. A transverse magnetic field is applied to the tube in order to increase the noise level at high frequencies and to eliminate the oscillatory nature of the electrical discharge usually obtained in a gas tube.1 The noise output from this gas tube is amplified in a two-stage amplifier. Between the first and second stages the noise spectrum is shaped in three different ways, depending on the setting of the range-switch control shown just below the meter in Figure 1. At the 20-lcc setting, a low-pass filter is inserted, which has a gradual roll-off above 30 kc, with the audio range to 20 kc uniform in spectrum level. The 500-kc setting puts in a low-pass filter that rolls off above 500 kc. At the 5-Mc setting, a ij. ti. Cobine and j. r. Currv, "Electrical Noise Generators," Proc. I R E., pp. 875-879, September, 1947.
peaking network is used that approximately compensates for the drop in noise output from the gas tube at high frequencies, so that a reasonably good spectrum is obtained out to 5 Mc. The output level is controlled by a potentiometer and a two-position switch, both these controls being located at the right as shown in Figure 1. The rectifier-type, average meter, located in the upper center of the panel, is calibrated to read the r-m-s value of the noise at the output terminals. Easily portable and weighing only 14 pounds, the complete generator is mounted in an aluminum cabinet with rounded corners and with rubber feet. 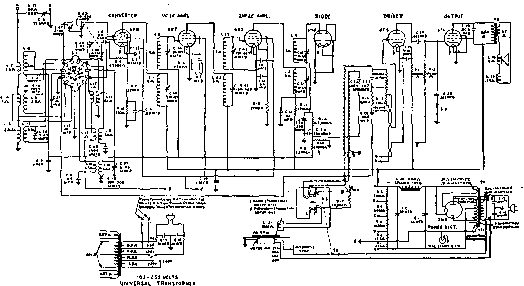 The a-c power input to the instrument is about 50 watts.